The Bishop of Limerick has paid tribute to Fr Jim Noonan, the brother of the Minister for Finance, Michael Noonan, who died on Tuesday after a short illness. Fr Noonan was an Irish missionary and served in Nigeria for 47 years. The Loughill, Co Limerick native had been unwell since last autumn. He passed away at the Kiltegan Missionary Society Care Centre in Co Wicklow. In a statement, Bishop Brendan Leahy described Fr Noonan as “a remarkable priest and human being” and said he had gone to his eternal reward. Fr Noonan is survived by his brothers Michael, the Minister for Finance, Tom as well as sisters Madeline, Joan and Mary. “He really was a remarkable man, a man who did quite remarkable work on the missions in Nigeria and in a very harsh environment there for all of 47 years,” Bishop Leahy said. Bishop Leahy said that the parish of Shanagolden-Foynes was delighted to welcome Fr Noonan home almost six years ago. He said the missionary priest was a quiet-spoken and gentle soul who had a deep interest in people and what was happening in their lives. 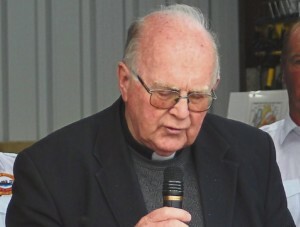 Bishop Leahy had visited Fr Noonan just last week at the Kiltegan Missionary Society Care Centre and said at the time he was very much aware of his health situation but was still in good spirits. “Indeed I found his whole approach very inspiring,” the Bishop of Limerick said. Fr Noonan’s Funeral Mass will take place in Kiltegan on Thursday at 12 midday, with burial afterwards in the local parish cemetery. His removal takes place today at 5:30pm. Mourners in Limerick will be able to pay their respects later at his Month’s Mind Mass which will be held in Foynes Church on a date to be selected.